Awakened with intention of attending church. But about the time we got ready to go, we were all called to S2. They didn’t want Russell and I, but Seehorn went off to fly to Stirling. Russell and I talked to Lt. Fincham for awhile and then returned to our tents. We dug out dirty clothes and leisurely washed them. Overseas, Sundays are objects of prayer, all right, unless one is required to fly, but every spare moment is used for something. Most of us will not sit idly by, as we are living every minute of our lives under stress and are occupied with little things needing done. We cannot let up on Sundays, and allow what we’ve gained through the week go by the wayside. The war has no ending when fought that way. Today, the Russians surrounded 37,000 Nazis in the Crimea and are busy obliterating the lot. The German General captured at Stalingrad, Von Paulus, appealed to the soldiers to lay down their arms, but they would not and continue to fight against overwhelming odds. We clambered into trucks tonight and traveled to the 6th Service Command to the movie Lost Angel1. A very touching show and it captivated our interest so much as it progressed that rain soaked us as we sat like stunned monkeys all through the picture. I won’t regret that in the least. A grand picture and some marvelous acting to say the least. Overheard at the orderly room tonight, we are again going up front on the 18th. 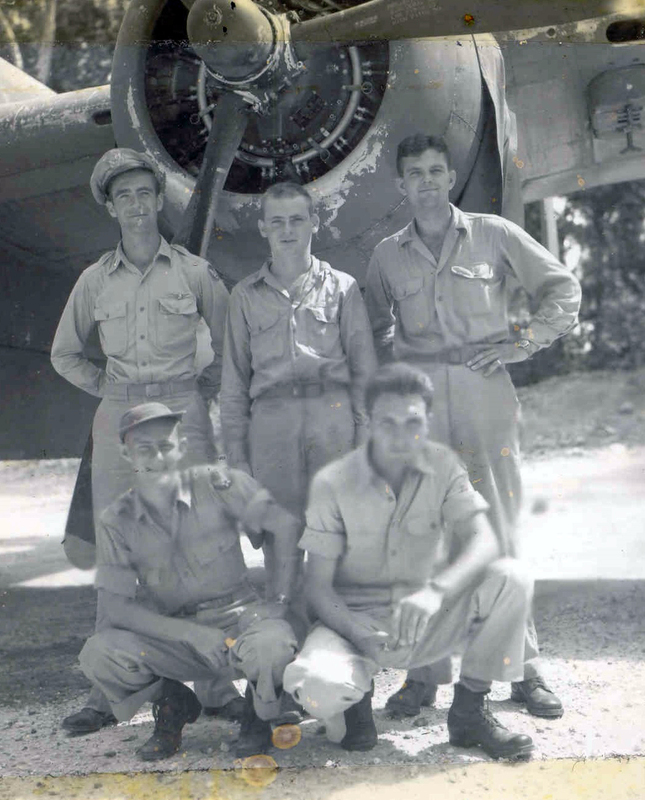 No news as yet as to whether or not Russell and I will be transferred to another squadron, kept with the 75th as spares or sent back to Guadalcanal to wait for an opening. Ho hmm! What a dull life. Very discouraging to a couple of boys who came overseas to fight. Guess we shouldn’t complain, but in the fighting is the returning home. The less battling the longer the war and the absence from our loved ones. Rough. Well that’s all for today, so I’ll bid everyone a good, good night with prayers. Bonnie, I adore you. 1Metro-Goldwyn Mayer released Lost Angel in 1943. See http://www.imdb.com/title/tt0036120/plotsummary?ref_=tt_ov_pl. This entry was posted in Uncategorized and tagged 6th Service Command, church, Crimea, Guadalcanal, Harland Robert Tolhurst, Harold Dean Fincham, laundry, Nazis, Robert Earl Russell, Russians, Stalingrad, Stanley LeVelle Seehorn, Stirling Island, von Paulus. Bookmark the permalink. Nice picture. Now we have faces with names. I recently finished scanning the few photographs that are available of those mentioned in Wayne’s Journal. I will be including them at the chronologically correct points. I’ve gone back and posted photographs of Stan Seehorn and Robert Russell. Do you have anymore pictures of my Grandfather? Harland R Tolhurst Love reading the stories the day in the life of…. We have my Grandfather’s flight logs and now we can get more of a story of his life during that time. He passed away before i was born. Thank You for posting all this. Reading he wants to fight so he can go home is most revealing about these men felt about all this. This is why this journal is such an important artifact.